Sunday Morning Wake-up Call host Rick Moore talks with UVa Associate Professor of Public Health Sciences and Public Policy, Carolyn Engelhard, about Medicaid expansion in Virginia. Topics include: Why it’s hard to kill the Affordable Care Act and Medicare for all. Sunday Morning Wake-up Call host Rick Moore talks with University of Virginia Professor Carolyn Engelhard about the future of The Affordable Care Act also known as ObamaCare. Topics include: A brief history of health care in America and the difference between the Affordable Care Act and the American Healthcare Act. Also, milestones in May and June 2017 that the ACA must survive. Ms. Engelhard also writes for The Hill. This Sunday Carolyn Engelhard joins Rick to talk about the Affordable Care Act (ACA). Ms. Engelhard talks about the latest ACA enrollment numbers, who is still not insured and the politics of Medicaid expansion. The Kentucky Governer’s plan to reduce Medicaid expansion and how it will affect 400,000 Kentucky residents is also examined. 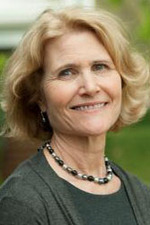 Carolyn Engelhard is the Director, Health Policy Program, Department of Public Health Sciences at the University of Virginia School of Medicine. Ms. Engelhard also writes for The Hill, a widely read policy/political source for staffers on The Hill in Washington DC. Her most recent story We Are All on the Government Dole talks about the government’s role in providing health care. WPVC 94.7 is a FM radio station serving the Charlottesville area. Founded by Jeff Lenert and Rod Howard the station plans to serve up a mix of progressive talk radio during the day and hip-hop music during the evening hours. If you are interested in becoming a producer with The Sunday Morning Wake-up Call, or in volunteering in general, you can contact the station here. Speaking this week about the Affordable Care Act, Rick Moore is joined by Carolyn Engelhard, Director, Health Policy Program, Department of Public Health Sciences at University of Virginia School of Medicine. Commonly called Obamacare, the Affordable Care Act has reached its one year anniversary and Rick and Carolyn discuss how the major goals of coverage for more Americans and reducing overall health care costs are coming to pass. The choices don’t have to be limited to For Profit versus Socialized Medicine. Risk Pools more sick individuals mean escalating costs. A moderate pool means getting individuals who are not sick to purchase insurance, is that preventive care? Carolyn Engelhard mentions Philosophical care, where older and younger individuals are paying nearly the same amount with the expectation that the younger insured will one day be old have others to pay for them. On the October 13th edition of the Wake Up Call, host Rick Moore talks with Carolyn L. Engelhard, MPA. Carolyn is a Assistant Professor, Health Policy Analyst and the Director of the Health Policy Program for the University of Virginia Health System. Rick and his guest have a comprehensive discussion about the Affordable Care Act aka Obamacare. Carolyn explains the truths about Obamacare – who it affects and how. What’s Next for Health Reform? CPN Original, National politics, Senior Center in Charlottesville, Senior Statesmen, Speeches and Presentations Comments Off on What’s Next for Health Reform? On June 28, 2012, the Supreme Court handed down its historic ruling upholding the Affordable Care Act (ACA), with the sole exception that Congress cannot penalize states that decline to expand Medicaid. What does the court’s decision mean for the ACA’s economic viability and the potential to provide health coverage for most Americans? What are the challenges facing President Obama’s signature health care legislation and how might the presidential election affect the fate of the ACA? Carolyn Long Engelhard is a health policy analyst at the University of Virginia School of Medicine, where she also directs the Health Policy Program in the Department of Public Health Sciences. Ms. Engelhard’s academic activities include studying and monitoring changes in health policy at the federal and state governmental levels and teaching in both the Graduate School of Arts and Sciences and the School of Medicine. In 2007, Ms. Engelhard co-authored a book looking at the myths surrounding the U.S. health care system. In 2009, Ms. Engelhard completed a project in conjunction with the nonpartisan Urban Institute examining the use of public policies to reduce obesity. More recently, Ms. Engelhard co-authored an article in the New England Journal of Medicine examining health insurance premium rating regulation under the new health care reform bill, and completed a textbook chapter examining the effect of the new law on health care organizations. 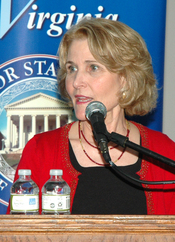 Ms. Engelhard spoke at the Wednesday, September 12, 2012 meeting of the Senior Statesmen of Virginia. The meeting was held at the Senior Center in Charlottesville. Following the presentation, questions were taken from the audience. The program was moderated by SSV Vice President Bob McGrath. Left of Center: Healthcare Reform: What’s Right and What’s Left? Obama and the Democratic Congress passed landmark healthcare reform after a rancorous year-long struggle. Republicans are threatening to make “Repeal and Replace” their fall campaign slogan, while Obama has welcomed that referendum and polls have shown a bump in public support for the reform now that it’s law. What did the law get right? How much will it really do for cost-cutting, expanding coverage, and improving quality? What major flaws of our system remain yet to be dealt with? How will the average American be impacted by the reform? What will it mean for political fortunes in the fall and beyond?